Sonata in B-flat Major, K. 292 (196c) (for Bassoon & Violoncello (Basso continuo)). Composed by Wolfgang Amadeus Mozart (1756-1791). Edited by Henrik Wiese. Arranged by Wolfgang Kostujak. For Bassoon, Cello. Chamber Music with Winds. Henle Music Folios. Softcover. 44 pages. G. Henle #HN827. 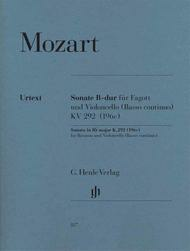 Published by G. Henle (HL.51480827).Did Mozart intend this work to be a duo for two bass instruments, or – as the simple basso-like manner of the second part suggests – a sonata for bassoon and keyboard instrument? We will probably never know the answer because the autograph has gone missing. Our edition allows different instrumentation; it not only contains scores for the duo version but also one so it can be performed as a solo bassoon sonata, following the style of the time with a figured bass realization. And cellists – who are not blessed with many works by Mozart – will appreciate the version of this endearing work for cello and figured bass.